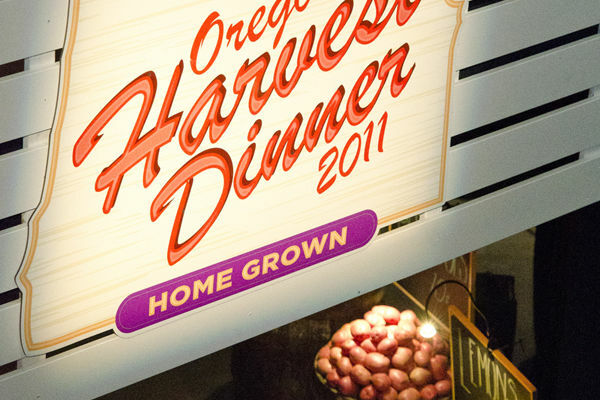 More than 400 guests donned blue jeans and bling for "Home Grown," the annual gala to raise funds in support of Oregon Food Bank’s mission: to eliminate hunger and its root causes. The gala, held at the OFB warehouse in Northeast Portland Oct 15, included an amazing dinner prepared with local ingredients by Michael Stanton, executive chef of The Heathman Restaurant and Bar; salad by David Anderson, executive chef, Genoa; and desserts from New Seasons Market. Among the distinguished guests were Mayor Sam Adams and former Portland Trail Blazer great Terry Porter. Sheila Hamilton from KINK FM served as emcee for the evening. Thanks to the generosity of the guests and other donors, more than half a million dollars was raised for Oregon Food Bank programs and services.